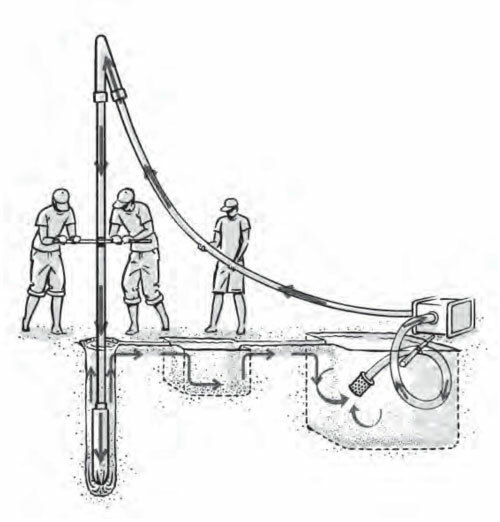 A technique used to sink wells more easily, more rapidly and to a greater depth than hand-dug or driven wells (See Sheets E29 and E30). A bored well is a cylindrical hole sunk vertically by percussion or the rotary action of a cutting tool (auger, drill bit) turning around a vertical axis. 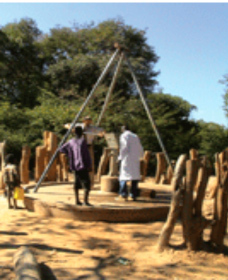 The diameter of a bored well can vary from 5 cm and 1.5 m.
Nearly all these wells are normally fitted with a water pump. The pump (manual, motor-driven, submersible) is chosen according to the well depth, the desired operating flow rate and the resources (technical, financial and logistical) that are potentially available. 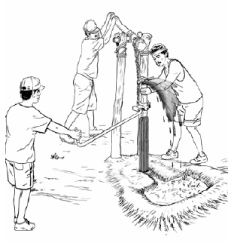 A borehole is an ancient technique dating back over three thousand years. It originated in China where bits of bamboo attached to a heavy weight were used to drill water wells. - Manual drilling using manual tools for fairly shallow wells up to 40 m deep. - Mechanised drilling using light equipment or a drilling platform and heavy equipment which can reach great depths. In some cases, the mechanised drilling machines are fitted on self-propelled mobile platforms that are much quicker and easier to use and which can drill into hard ground at great depth. They are however far more cumbersome. Comment : the mechanised drilling machines are often too expensive for the poorest populations in rural or near-urban areas. Manual drilling techniques must not be ignored, even if they are slower and rather more tiring. Manual drilling is a practical solution that, although tiring, is advantageous and inexpensive for water points less than 40 metres deep in soft ground such as clay or sand and soft rock like soft sandstone or limestone. 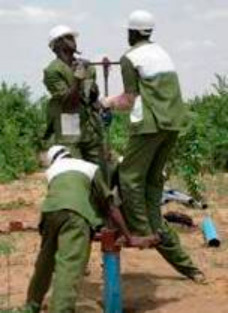 Where the characteristics of the ground permit, drilling a manual borehole can prove to be more than four times cheaper than a mechanised borehole. But in hard ground, or when wishing to drill to a great depth or avoid difficult work or go faster and the means are available, mechanised boreholes and a better, even essential solution. 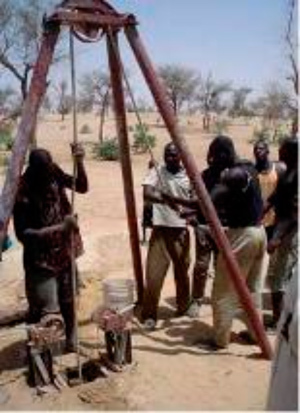 The cheaper manual boreholes are of interest to the NGOs and public authorities as these techniques can produce more wells. They also appeal to villages, small communities and farmers in rural areas with few resources as they can drill small boreholes themselves with a minimum of help and advice. There are in fact numerous processes and it can be fairly difficult to distinguish between them given their sometimes curious names, which can also vary according to the engineered structures and the language used (often English). - manual mode : hand-auger drilling for communities with few resources, percussion or cable-tool drilling (up to 25 m) and rotary sludge drilling (also called mist or rotary manual drilling, up to 35 m). 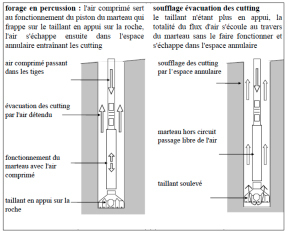 - mechanised mode : compressed air percussion drilling (also called down-the-hole hammer drilling or rotary percussion drilling). They are primarily used for their low cost price, for shallow depths and for sinking in relatively soft ground, although some techniques, such as compressed air percussion drilling or down-the-hole hammer drilling can bore into fairly hard ground. Cheap manual tools are used (for example, gimlets called augurs which are turned with muscle power. Hand-auger drilling involves turning a gimlet, or auger, with a large handle. Steel extensions are added as the auger is forced further into the ground. When the auger is filled with spoil, it is hauled up to be emptied and then the operation is repeated. 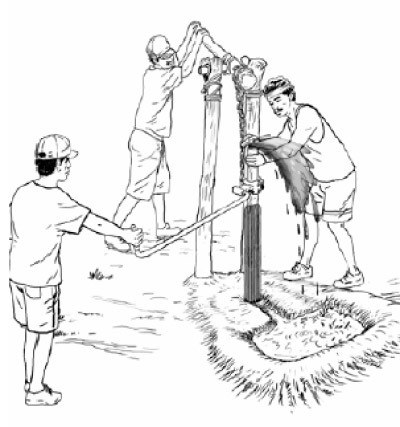 The borehole normally remains open above the level of the water table and does not require shoring up. A temporary preliminary well casing can be used when the water table is reached to prevent the borehole walls from collapsing. Drilling continues inside this preliminary well casing with a bailer until the desired depth is reached. The temporary well casing is then removed and the permanent casing inserted. Hand-auger drilling can be used up to about 15 to 25 metres deep and in soft ground (sands, silts or clays). In percussion drilling, a heavy cutting tool (the bit) is attached to a rope or cable then dropped under its own weight into the borehole. A tripod is used to raise the tool with the rope or cable. The bit breaks up the ground when it falls back down. Water is added to the hole which mixes with the spoil and turns it to mud. This mud shores up the borehole walls and raises the rock spoil but is also brought to the surface with a bailer. The bit is raised and dropped in the hole as many times as necessary. It is often necessary to use a mud column and more importantly preliminary well casing in plastic or preferably steel to prevent any risk of the hole collapsing, especially when the ground is soft. 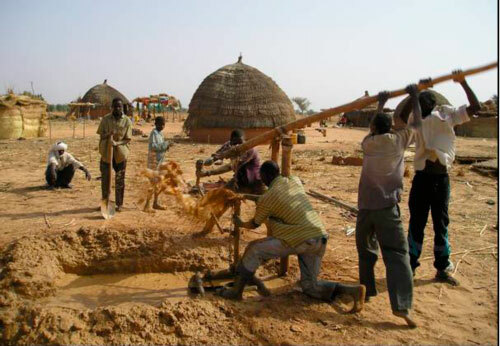 The percussion (or stone hammer) technique is normally used for depths up to 25 metres for drinking water, but deeper boreholes can be drilled. Percussion drilling can be combined with other drilling techniques like hand-auger drilling, which drills the first few metres of the borehole quickly as far as hard ground. The technique involves driving a pipe into the ground by pressurised injection of a large amount of water using a motor-driven pump or foot-operated pump. It is used for drilling shallow boreholes rapidly, most frequently in less than a day, at moderate cost. Driven (or instantaneous) wells and drilled wells are often confused as they use fairly similar processes. The main difference is that in a driven well, a tube with a perforated screen at its end is driven in directly, whereas the screen is only installed in a drilled well once operations have been completed. This is one of the most used techniques. It has been developed from the direct jetting technique. It can sink deeper boreholes but can only be used in sedimentary ground. Note however that another rotary technique called rotary drilling (see further above) operates under a similar principle, but mechanised (use of a compressor or a small motor mounted on a frame). This technique can drill deeper and in hard ground. It is also based on the circulation and pressure of the water and on the use of a heavy perforating that here is turned. 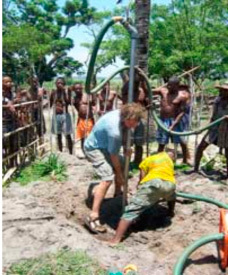 The water is injected inside the drilling string and the mud (water and spoil) rises along the borehole walls. A motor-driven pump is used preferably to obtain sufficient water pressure. The bottom of the drilling pipe can simply be left open or, more frequently, a pipe ramming tool (bit) is added. Abrasive action is applied to the ground by a three-blade or three-cone bit rotated manually from the surface using a drilling string. The spoil or cuttings are raised to the surface by the mud circulating in the borehole. It enters the rods, exits via the drilling tool, rises to the surface via the annular space between the borehole walls and the drilling string, is decanted into small cavities dug near the borehole and is then pumped and injected once again. A drilling fluid (additive) can be mixed with the water to prevent the borehole walls from collapsing and the uncontrolled loss of air through infiltration. The water jetting technique (with rotation) can be used up to depths of about 35 - 45 metres. This method has been developed and become widespread in Bangladesh using bamboo pipes. A borehole drilling string is driven manually and gradually into the ground using a lever arm and water is circulated to bring the cuttings produced by the drilling tool up to the surface. The drilling string is operated manually from the top downwards using a sort of pole to be able to raise it again. In some cases, an operator also turns this drilling string manually to lower it more easily. As the rods are lowered, the shock created on the ground by the bit fixed to the end of the drilling string breaks up the ground and above all fragments the materials. To bring the cuttings to the surface, the operator plugs the upper end of the drilling string with his hand whilst another brings it up to create (valve effect) a suction of the water and the spoil it contains up to the surface. During the next downwards movement, the operator removes his hand from the drilling string and the mud spurts into a small pond dug beforehand by the side of the borehole where the spoil is deposited and where the settled water is once more injected into the borehole. The water pressure on the borehole walls and the mud prevent the walls from collapsing. This type of sludge drilling (with or without rotation) can be used up to depths of about 35 metres. Rotary drilling uses a bit that leads a string of rapidly-turning rods with a cutting tool (three-cone or three-blade) at its bottom. This pierces the ground and is driven in under the combined effect of the thrust of the bit and the weight of the drilling string. Pressurised mud is injected inside the rods. 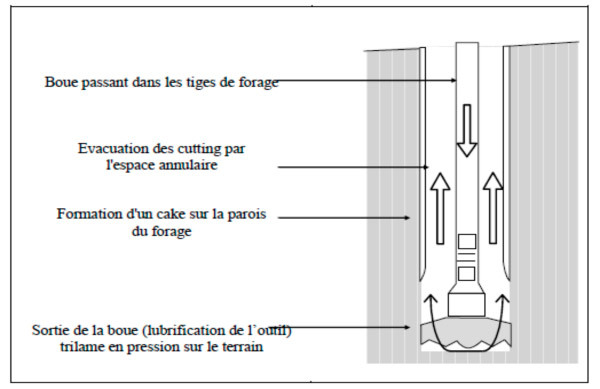 The drilling mud prevents the walls from collapsing, consolidates them (cake) and brings the cuttings to the surface where they are deposited in a settling pond. The recycled mud is re-injected into the drilling string. Rotary drilling is possible with light mechanised equipment, namely a motor mounted on a frame, a small compressor and a mud pump. This rotary drilling technique uses heavy piercing machinery which can reach great depths. The machinery is mounted on large straight or tracked vehicles. It uses rotary drill equipment that pierces, chews up or breaks the rocks, of, if the ground is soft, large gimlets called augurs. The boreholes can be several hundred metres deep. 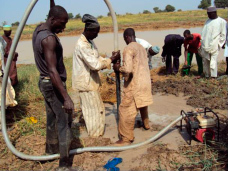 A pump is often installed at the bottom of the borehole to pump the water up to the surface. have them and potentially hire them out. It is however important to point out that some bodies or NGOs have also developed or adapted with manufacturers mechanised drilling machinery that is also mobile but which is far lighter and suitable for certain types of drilling. 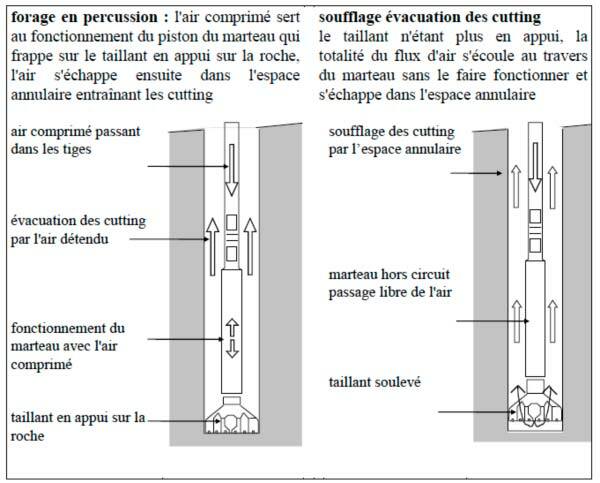 Thus ACF (Action contre la faim) has developed three rotary- or DTH hammer-drilling kits (ACF-PAT 201, 301 and 401) for its boreholes. These were produced initially by the Thai company PAT and adapted (see ACF document given at the end of the sheet). Mechanised drilling with light or heavy machinery requires professional operators, machinery and a large budget to finance the operation. These systems are therefore not suitable for rural areas in developing countries. The DTH hammer drilling system can go through hard ground like granite or consolidated sedimentary layers (sandstone, limestone). The rotary technique with light equipment is used in sedimentary ground whereas the heavy, platform-mounted machinery can drill through hard ground to great depths. 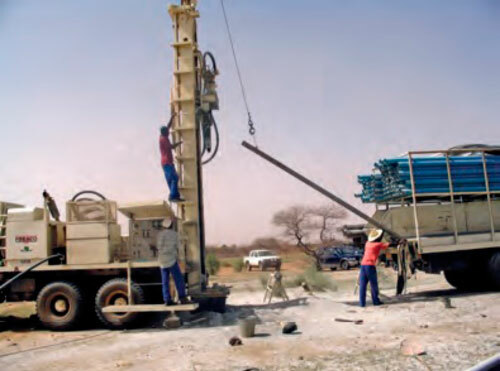 The cost of sinking a borehole depends significantly on materials and equipment used, the structure of the ground, the depth to be reached (i.e. the depth of the water table) and the required flow rate. 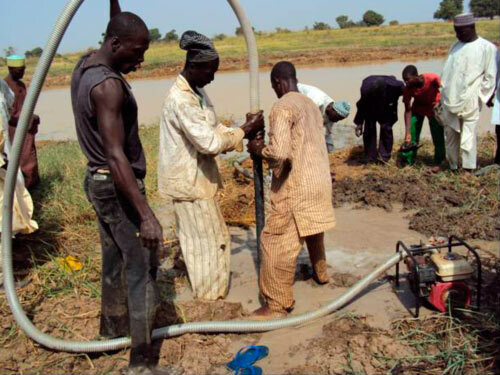 It is therefore difficult to give an accurate cost for sinking a borehole, especially as the cost will also vary from one country to the next and whether or not the population provides part of the manpower on a voluntary basis. As a rough guide, the cost of a borehole some thirty metres deep using manual techniques can be between €200 (rare case in Cambodia) to €3,000. Manual drilling equipment can frequently be manufactured, transported and maintained locally. For a borehole about 60 m deep drilled with mechanised equipment, the cost can range between €4,000 and €13,000 (Examples noted by Caritas : €6,500 in Ethiopia, €8,700 in Burkina Faso, €12,000 in Togo - Examples noted by ACF : €4,000 in Guinea, €13,000 in South Sudan), but these machines can drill up to 120 m deep. There are many hybrid techniques associating those presented here. They can improve the sinking efficiency of bored wells by combining the advantages of these various methods. 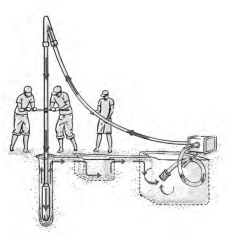 - insert a preliminary well casing, at least over the first few metres for a borehole in soft ground, so that it can be finished without putting the work at risk and the walls are prevented from deforming or collapsing when the ground is unstable or when using certain percussion machinery like the DTH hammer drill. - plan to insert the well casing (often in PVC) rapidly at the end, in principle over its full length, including when it passes through rock. If the well casing does not extend the whole way to the bottom (for example, a slight collapse or deposit of cuttings), a full pipe plugged at its base should be inserted shortened to 50 cm to 1 m less than the total depth of the borehole. - insert gravel packing at the bottom of boreholes, which is also essential if the well casing does not reach the bottom. This is lowered along the annular space in the well casing and, when fixing the capture column, filters the water entering the perforated screen by stopping the fine particles of sand or other material. The screen is a perforated tube inserted at the end of the well casing to capture the water from the aquifer without particles. The amount the screen is opened depends on the particle size of the capture. The gravel packing means that screens with wider perforations can be used, thereby increasing the flow rate and longevity of the borehole. - construct all the other ancillary facilities for the best possible use and safety of the borehole (reinforced concrete platform, slightly sloping ditch at least 5 m long, secure perimeter, etc.). - Mud plays an essential role in most drilling techniques. Its density and viscosity should be checked regularly during drilling as they influence the raising of cuttings and consolidation of walls (heavy mud is preferable), as should its temperature, as this lowers the temperature of the drilling tool. Additives like polycol can alter some of these parameters. 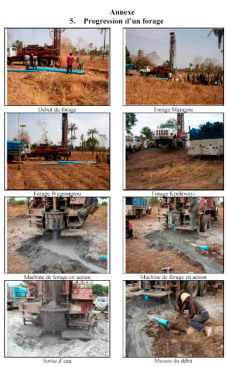 This study examines the importance of manual drilling operations on the improvement in the drinking water access rate in Chad, as the sole use of costly conventional drilling techniques (mechanised) cannot satisfy the demand for water throughout the entire country. - Ontario Ministry of Agriculture, Food and Rural Affairs : Private rural water supplies. - WEDC (Water Engineering and Development Centre, Lougborough University) has carried out a summary comparison of simple borehole techniques. - VIMEO : this shared site gives access to a certain number of videos (in English) on building a well prepared by the Bolivian NGO EMAS (Escuela Móvil de Agua y Saneamiento - Mobile School for Water and Sanitation). This NGO puts together good value training programmes and solutions for access to drinking water in many countries.